It's shark week on the Discovery Channel! Many of shark shows in this week-long television series are a little too dark for young children so we decided to celebrate by picking up a light and silly shark read from the library. "I'm going to choo-choo you up and spit you out." / "HA! I'm going to fin-ish you, mackerel-breath." You know that toy box full of toys in your home? Buried deep within you might just find two rivals ready for some friendly competition - shark and train. At least that's the case in a new picture book by Chris Barton called Shark Vs. Train. Two kids rummage through their toy box and bring out a toy shark and a toy train that face off in various silly competitions. Who rules the ocean? How about the tracks? The card game, "Go Fish?" OK, those scenarios are fairly easy to call. But who would prevail in a game of hide-and-seek or a burping contest? You'll need to read the book to learn the outcome of those match-ups. 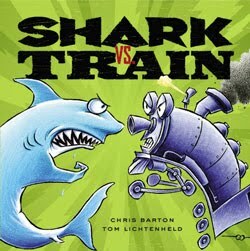 Lichtenheld's comical illustrations, complete with snarky narratives in word balloons, portray the hilarious expressions of both the shark and train at moments of glory and defeat. The caboose even makes a few funny comments. It's so very clever, you'll need to page through it multiple times to catch all the humor. 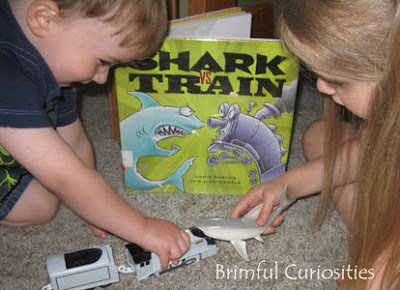 My kids quickly searched their toy box for a shark figure and a train right after reading the book and played out their own shark vs. train scenarios. The battle became quite heated at one point and one shark attack left the train derailed. (I quickly reminded the competitors that even though they may have ornery and cantankerous dispositions, the book shows mainly friendly, non-contact sports.) Shark: 1 ; Train: 0. A strange result considering both my kids wanted the train to win in the book. That's imaginative play at its best, prompted by a creative and fun book. I wonder which of our toys will tangle next? Want more children's shark activities, projects, crafts? We love this book! Next time we read it, we'll have to pull out a train and shark too. Such a fun idea! It sounds like the only thing that could make it better is if you added a dinosaur! We'll have to look for this book. This is Tom Lichtenheld, illustrator of Shark vs. Train. Thank you for covering our book, and for the fun photograph! Great review! First Dive to Shark Dive is another good book on the subject. It's a higher level picture book. I appreciate all these reviews you do!! How random and totally fun! If I can find it at the library, this might be our next train-themed book! Thanks! Thanks for Linking Up at Feed Me Books Friday! Looks like a fun book - my nephew is a shark fan... I'm thinking birthday gift! Maybe he can read it with my son (the train fan) It would be a real match-up.